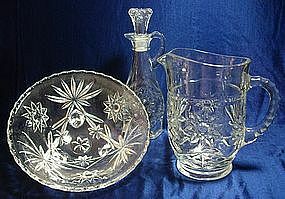 Anchor Hocking EAPG or Star of David Pattern Glassware. I have the following pieces available: Punch Bowl Base Serving Tray 12" x 6 1/2" Serving Tray 8 1/2" x 5" (has been repaired) Tab handled divided relish 10" x 6" 3 oval relish 8 1/2" x 3 7/8" Round Candy Dish w/Lid 7 1/4" diameter Footed Bowl 6 3/4" dia x 3" hi Quarter stick butter server 2 cruets 7 3/4" hi including stopper 2 pitchers 5 1/4" hi 3 creamers 1 tumbler 4 1/2" hi 2 Juice glasses 3 1/2" hi 7 coasters 3 3/4" dia 4 plates/saucers 4 1/2" diameter All these pieces are in great condition unless noted above. Please e-mail for pricing, offers are welcome!